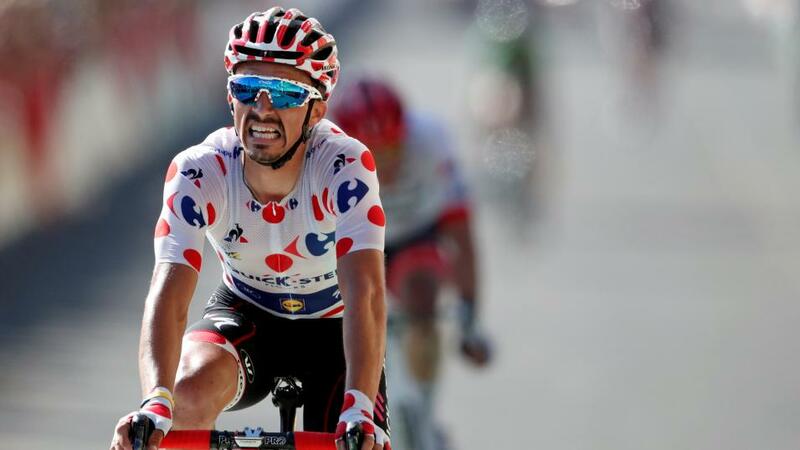 Tour de France Stage 15 Odds & Tips: Alaphilippe in the break-away? "It feels as if I could name 15 riders and still miss the winner. Valverde, Barguil, Yates, De Gendt, Jungels, Mollema... any rider who has had their GC ambitions quashed and is now hunting for stage victories has a chance on this stage..."
182km long, with three categorised climbs. The last and most difficult of these is the Category One Pic de Nore, with riders then descending for over 40km into the finish in Carcassonne, a gateway to the Pyrenees. There will be lots of interest from the helicopter camera-operators as the route crosses the Millau Viaduct in the opening kilometres, but soon thereafter, all eyes will be on the roll-call for the break-away, as Stage 15 looks made for a buccaneering group of riders to hold the peloton at bay. Whoever reaches the outskirts of Carcassonne first - peloton or break-away - will need to be aware that the run-in has its complications. There are some tricky turns and road narrowing around 4km out, and the final kilometre is a false flat, which sees riders slowly climbing to the line. Keep this in mind if betting in-play. Like Stage 14, this day is wide open, and it would be foolish to lump on any one rider. However, Julian Alaphilippe ([9.00]) and Peter Sagan ([10.00]) are worthy enough favourites. There is a strong chance that both will try to be in any break-away - Alaphilippe in order to collect more King of the Mountains points; Sagan to marshal the intermediate sprint, which comes much later on in this stage - and so both will be in with a chance as the race goes up that final climb. Alaphalippe is more likely to be competitive on that climb, but then, if Sagan were to summit in contention, his descending skills and sprint would make him virtually unbeatable thereafter. Alaphalippe will need to drop Sagan on the Pic de Nore to stand a chance of winning here. It feels as if I could name 15 riders and still miss the winner. Valverde, Barguil, Yates, De Gendt, Jungels, Mollema... any rider who has had their GC ambitions quashed and is now hunting for stage victories has a chance on this stage. Committing too early to any one rider when their intentions are not known is probably unwise, though. Instead, this is a stage to bet on in-play. It's likely of most interest for the Mountains Classification, where Julian Alaphilippe ([2.04]) now leads Warren Barguil ([3.05]). Alaphilippe looks a strong favourite in that competition after picking up more points on Stage 14, although he'll be aware that the bigger mountains of the Pyrenees will give Barguil the opportunity to close should his effort falter. The Points Classification is now over as a betting contest, with Sagan's lead insurmountable if he survives until Paris. The most interesting aspect of the Green Jersey competition now is deciding how soon Sagan will surpass his record points haul of 470, and what new mark he will set. He currently sits on 437. There's every chance that General Classification teams will be happy to see a break-away establish an impossible-to-close lead so that they can have an easier day in the saddle. Having said that, there is a rest day on Monday, so perhaps someone will fancy a cavalier early attack and daredevil descent? Maybe Chris Froome will see it as his best chance of re-establishing dominance over his team-mate, Geraint Thomas, or maybe Tom Dumoulin will consider it his only method of breaking the dominance of Team Sky? As I say above, it's a hard stage to predict, so let's start placing a few smaller bets in-play when we know what shape the stage will take.